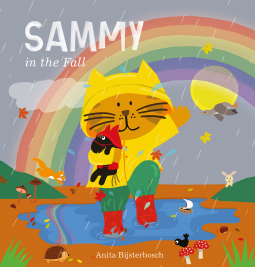 Thinking ahead to cooler weather: Sammy in the Fall by Bijsterbosch – Joyce's mystery and fiction book reviews with some non-fiction too! Sammy in the Fall is a cute read-aloud with brightly colored, appealing illustrations. Young listeners will watch as Sammy. a cat, and his stuffed animal. a pony named Hob, enjoy a variety of fall activities. For example, they rake and play in the rain. There are many things to see in each illustration. from the pony to hedgehogs to ducks. The book takes place over the course of the day and ends with Sammy reading to his pony and going to bed. This is a sweet book for preschoolers.